In this review, we are having a look at the first ITX motherboard based on Intel’s Z270 chipset to find its way into our labs, the ECS (Elitegroup Computer Systems) Z270H4-I Durathon 2 Mini ITX. The company’s approach is to create a compact and reliable, yet cost effective motherboard for typical home entertainment and gaming systems. A quick look at its specifications reveals very interesting features for a motherboard that retails for less than $110, with the marketing team even praising its overclocking capabilities. We will examine its core features and capabilities in the following pages of this review. The design of a low-cost motherboard is usually simpler than bigger designs, with the manufacturer sticking to the integration of the most common features. 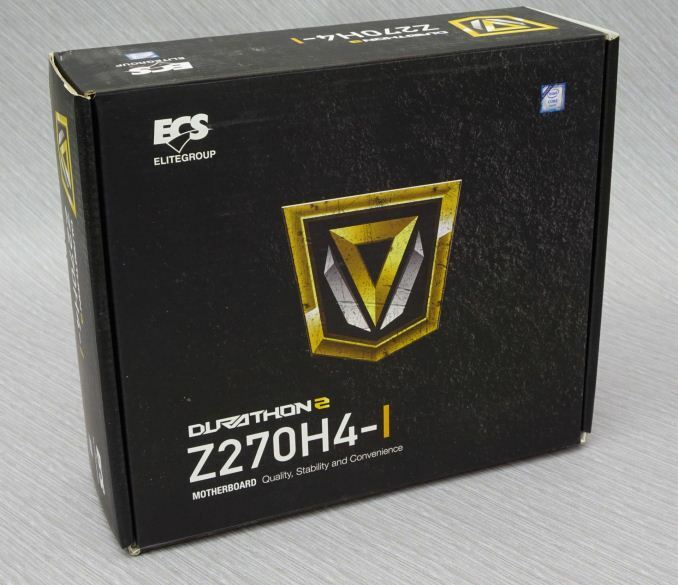 The ECS Z270H4-I Durathon 2 is, by contrast, an unusual product. With the company intending to market it towards gamers and overclockers rather than HTPC/casual users, the designers of the Z270H4-I try to implement features that gamers could use but, in order to keep the manufacturing cost low, skipped features that they thought gamers do not have a use for. A quick glance reveals the presence of dual Gigabit LAN, something that we do not expect to find on cost-effective designs, for example, both of the Gigabit controllers are high-performance chipsets but from different manufacturers (Realtek 8118AS + Intel I-219V). The HD audio CODEC also comes from Realtek and is the popular ALC1150. It has four SATA 6Gb/s connectors, which are adequate for a Mini ITX motherboard. There are also two M.2 slots but only the one at the rear of the motherboard can support SSD drives. The M.2 slot at the front of the motherboard is for a WiFi/Bluetooth M.2 card, which is not included in this motherboard’s bundle. There are many USB 2.0 and USB 3.0 ports and headers, yet not a single USB 3.1 10 Gb/s Type-C or Type-A port, which is a cost cutting measure, unfortunately for anyone with a modern high-speed mobile or storage device. As ECS is trying to promote the Z270H4-I towards gamers, and its marketing focuses most of their effort on the motherboard’s reliability and overclocking capability. On its default settings, the Z270H4-I does perform just as well (or even slightly better) than any of the Z270-based ATX gaming motherboards that we reviewed recently, yet that is because of the BIOS settings that allow the Z270H4-I to persistently run the CPU at its maximum turbo frequency. Other than that, the overclocking capabilities of the Z270H4-I left us indifferent - it has a very broad range of overclocking options but the actual capabilities of the motherboard are highly limited by its power circuitry and thermal design. Even though ECS’s marketing is strongly focused on the overclocking capabilities of the ECS Z270H4-I Durathon 2, our overclocking experience was mediocre at best. The BIOS settings are more than adequate and the range of most options is very broad. Some of the voltage settings even are ridiculously broad, such as, for example, the motherboard allowing the CPU core voltage to go up to 2.5 volts. A quick glance during our very first visit into the BIOS revealed that the Z270H4-I has, like most motherboards nowadays, the multi-core turbo option pre-enabled, boosting the turbo performance of the CPU up to 4.5 GHz for the first core and 4.4 GHz for the other three cores. This option is by default enabled on the vast majority of modern motherboards, allowing the system to temporarily push the CPUs slightly above their regular ratio. What is very peculiar however is that, by default, the BIOS is set to override the CPU power and ratio limits. Our preliminary testing revealed that, without manually tweaking any BIOS settings, the Z270H4-I was persistently pushing our 7700K up to 4.4 GHz with either single-thread or multi-thread loads. Unlike other motherboards, the Z270H4-I does not have any “automatic” CPU overclocking settings that automatically tweak the CPU’s voltage and ratio to predefined values. 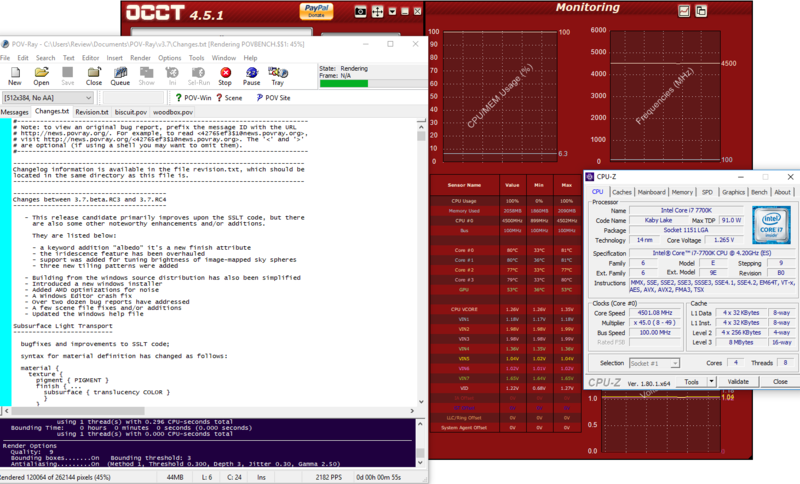 Any overclocking needs to be performed manually. However, no matter the voltage and power limit settings, we soon found out that the Z270H4-I simply would not drive our 7700K above 4.5 GHz. As seen in the following picture, even though the CPU ratio was set at ×49, all power limits were disabled and there were no thermal issues, the motherboard is maintaining a CPU frequency of 4.5 GHz under full load. We are unsure if that is due to a BIOS bug that needs to be resolved or, most likely, due to the physical limitations of the motherboard’s power circuitry. We also had no luck with BCLK/FSB overclocking, as the Z270H4-I was entirely unstable with the frequency set at anything higher than 104 MHz.